Guru Estates is a real estate consultancy organization with extensive resources and ability to offer personalized professional services in India. Our professionalism is hallmarked by quality, innovation and effectiveness, while delivered with enthusiasm and determination. Empowered with the cutting edge knowledge of trade trends and practices, our deals have inculcated confidence and genuine satisfaction amongst the real estate buyers. Our primary is to focus on meeting the needs of clients, from assisting them from property search, sale or leaseback, financing, due diligence to smooth closing and lease signing registration. We have built a reputation for client satisfaction, and we are devoted to making your move as easy as possible. Our network of licensed real estate professionals and financial institutions will optimize your chances to acquire or dispose properties with the best returns. 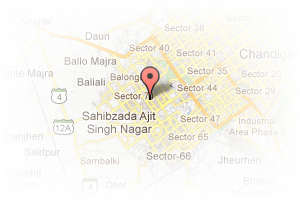 Guru Estates is one of the leading Real Estate dealer in North India since 2008. Once you come in contact with the professional team, you will look no further. We have been catering to our clients by providing total solutions right from buying/selling all types of Vacant or Rented IT, Commercial and Residential Properties as well as Agricultural land, Leasing and Maintenance of properties on behalf of the owners. sector 125 is the very prime location of mohali , its bisects by 3highways of 200 ft roads , and the rest all amenities just in 5 min drive . 200 ft highway rd . all aminities near sector 125 . Address: SCO-31, Mega Market, Opp To Naval Housing Society, Sector 125, New Sunny Enclave, Sector 125, Mohali, Chandigarh, India. This Broker Profile page for "Guru Estates" has been created by PropertyWala.com. 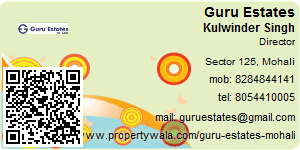 "Guru Estates" is not endorsed by or affiliated with PropertyWala.com. For questions regarding Broker Profiles on PropertyWala.com please contact us.